Occasionally a cultural phenomenon bursts into mainstream focus like a shooting star, whose glow causes our entire society to change. The Grateful Dead converted millions of Americans over four decades into “Deadheads,” a passionate uprising of fans unified by common values and creative expression. Until the new millennium (and shortly after the passing of the great Jerry Garcia), fans eager to connect with others inside the community were generally limited to the company of their cohorts and the Deadhead fellowship at every concert. And while no other band can claim to have more enthused followers since the group dissolved in 1995, the need for a cultural succession, combined with the dawn of online networking, has given rise to an unprecedented community all its own. Gone but not forgotten is the era of the Dead. Today, however, one artist uses his eclectic love of music to channel the band’s spirit and communal closeness among fans. Meet Lorin Ashton a.k.a. Bassnectar, the 37-year-old electronic producer and DJ known by his fans as the “King of the Sound.” The San Francisco native did not find his roots in electronic music, or even in the music of the Grateful Dead. Ashton’s musical journey began with the hard metal gruff of the 90s: headbanging to the more technically proficient sounds of Slayer, Foreigner and Resurrection, while avoiding the irky hair metal era of the 80s. A multi-faceted musical evolution led him to producing electronic music. 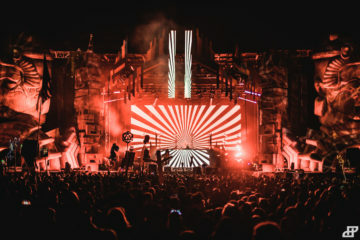 And while many DJs of the early 2000s like Moby, Tiësto, and Armin van Buuren pledged allegiance to a particular style of music, Bassnectar began creating electronic music in freeform – a boundless palette of music and sound. 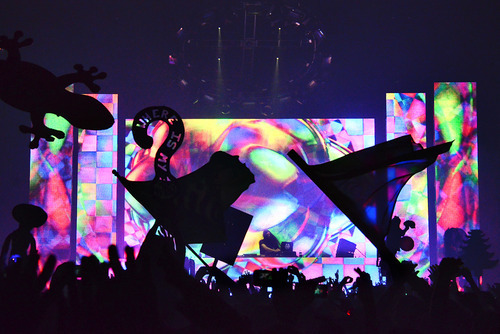 Bassnectar performing in Hampton, VA, in December 2013. 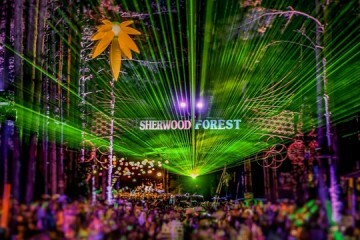 Beloved by “Bassheads” are not just the original Nectar anthems that pack heavy bass vibrations, but the artist’s proficient use of other beats outside the boundaries of dance. The music of The Beatles, Jimi Hendrix, Rage Against the Machine, Nirvana, The Pixies and more have been featured in Ashton’s live performances. 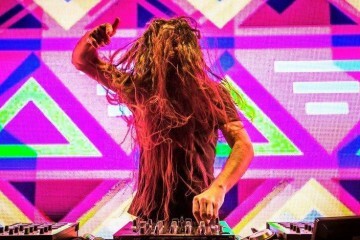 Fans of the electronic music orchestrator have come together to form the “Bassnectar Family,” a loose title to describe anyone in love with the producer’s ever-evolving ‘style. Like the Grateful Dead, Ashton merges serious dedication to his craft with powerful messages to draw a mass of like-minded fans together. One of the DJ’s first community-oriented ideas was simple: to take a “family photo” with the crowd at all of his concerts, and later post the images to Facebook for fans to view (the entire gallery now showcases over 300 shots). Bassheads from around the world can view the photos and reconnect with other members of the Family. Welcome to the “Churn of the Century” – both the title of a classic Bassnectar tune and an accurate description of the cultural revolution happening in music right now. 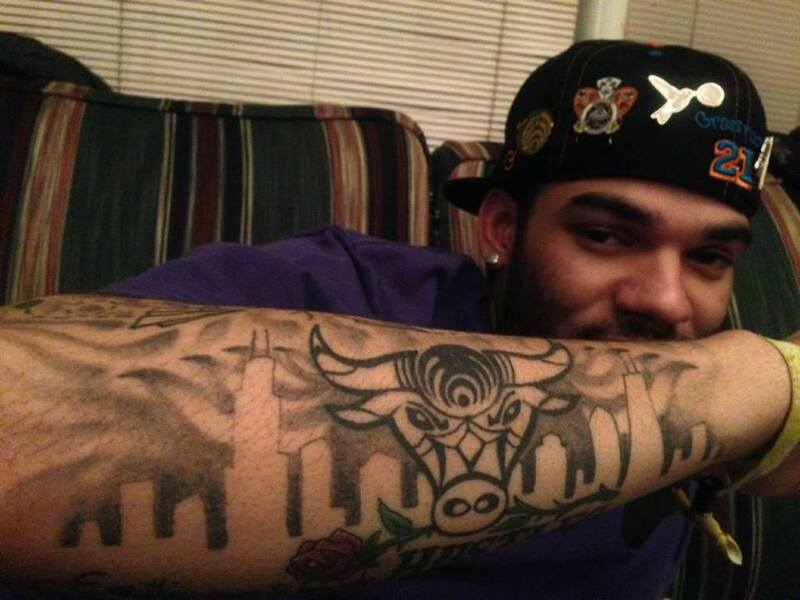 Alex Hull’s Bassnectar experience compelled him to interact with the Bassnectar Family online. Known by his artist moniker “Lex Newtho,” Hull is the CEO of his own artwork company. At 27 years young, the Kansas Native markets his work through BOW’t Designs, which he started last August after completing a BFA degree in drawing from Kansas State University. 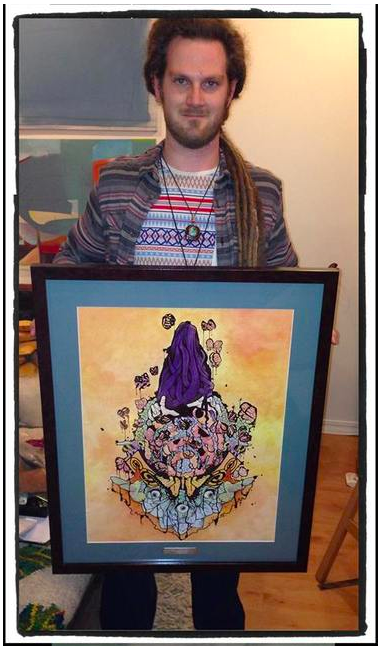 Alex Hull with his custom Bassnectar painting. Hull began designing artwork inspired by the electronic producer. 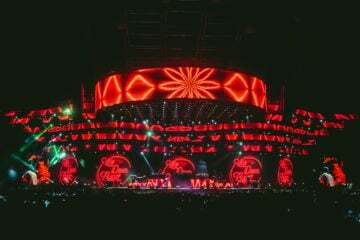 His first creation was the “Bassophant,” a pink elephant standing atop Bassnectar’s logo, which he released to widespread community praise. Alex emailed his design to Ashton, and the independent creation was turned into a sticker that was sold as official merchandise on the 2012 Vava Voom Tour. This was another key fan interaction that caused waves of Bassnectar fans to feel compelled to create their own piece of BassnectART. The “Bassophant” did not just trigger a vibrant burst of life to the digital art scene, but also the dawn of a subculture and business all its own. 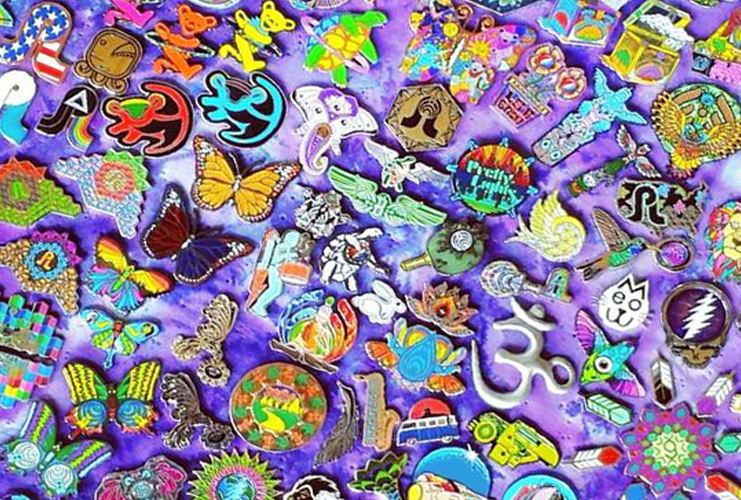 Left: The original “Bassophant” pin. Right: A collection of pins designed by Hull. As of January and after just 16 months of designing, Hull’s portfolio of BassnectART includes five shirts, eight hats, 20 pins, and a full 24 x 18 painting that was painted during a live drawing installation at a Bassnectar show. He has also experimented with original designs and other pieces inspired by Grateful Dead and the Electric Forest music festival. “This whole movement has been responsible for me being able to make a living as an artist, which is exactly what I’ve always wanted to be able to do,” says Hull. 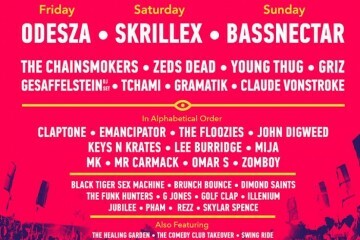 The debut of Lex Newtho coincided with Bassnectar’s meteoric ascension to music superstardom. After experimentations with the trending sounds of dubstep, Ashton finally captivated a mainstream audience nearly a decade into his career; likewise, Hull spent almost a decade freelancing before finding his niche in the Bassnectar Family. Once approved by an administrator, anyone can join the Marketplace to post, sell, and seek advice on their work. 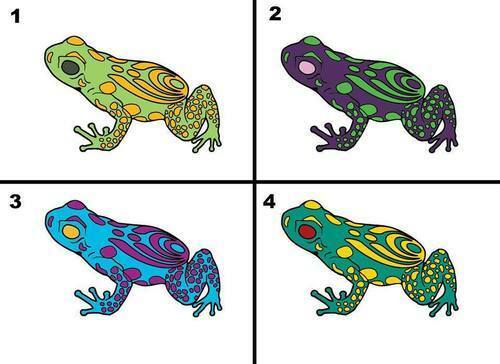 Brendan LeComte, a 21-year-old college student with minimal background in art or graphic design, created a frog pin in his free time to celebrate the popular, live-only Bassnectar track. The “Bassfrog” pin, a collaboration between Brendan LeComte and Butterfly Beings Designs. Quick math reveals that Brendan is able to sell his pin for as much as twelve times its production cost without taxation, regulation, or overcharging the customer ($15 is the communally-accepted standard for any single pin sold in the Marketplace). Pinmakers are free to distribute their product as they please without any fiscal interference. 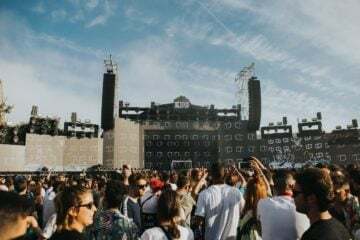 Between the Bassnectar Marketplace and other popular groups such as “The Pretty Nectar Auction House” and “The Lot,” dozens of transactions occur between buyer and seller on a personal messaging basis every day. There are currently no laws that prevent artists from listing their products online without paying a fee of some kind, a fact that accentuates how new this cultural phenomenon is. 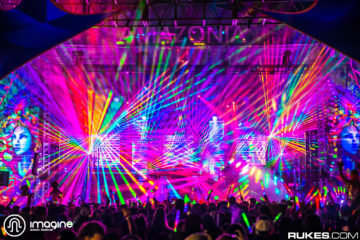 Beyond the internet, and even Bassnectar, the artistic community in the electronic music world has become a flourishing society. Emily Kukawka, a 25-year-old designer, is another example of independent success. She creates tie-dye shirts, event posters, and tattoos under the name “PurpleHatter.” Most designers have pre-sale orders online and keep only a small amount of their product for shows, but Kukawka enjoys meeting her customers. “It’s been remarkable getting closer to people because of my artwork. They remember me and come hug me without a question. It’s warming!” said Kukawka. 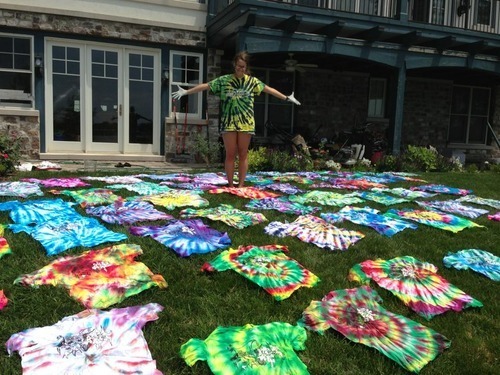 Emily Kukawka a.k.a “PurpleHatter” designing tie-dye shirts for the Electric Forest music festival. Young Americans exist in a work society fueled by competition, but possess the tools necessary to create a career of their own. With the dawn of Web 2.0 and the simplification of e-commerce, starving artists are able to use the power of online influence to transform themselves into self-employed virtuosos; Alex Hull’s journey through Basshead culture and the architecture of BassnectART has led him to total self-sufficiency before age 30. A special vision is necessary to create art that both amazes and challenges its audience to create for themselves; The Grateful Dead pioneered the craft. Leave room in the history books for the surge of Bassnectar and his fans, though – they are channeling the Deadhead vibe and forging an identity all their own. Special thanks to Alex Hull, Liam O’Kennedy, Brendan LeComte, Lauren Michele of Eli’s Den (top pinboard), Emily Kukawka, Mike J. Barone, Jesse Smith, MASS EDMC and YourEDM.com!